Coming away from Sanya without any points was frustrating last weekend, especially as both Sam [Bird] and Robin [Frijns] were taken out of contention through no fault of their own. However, as anyone who knows Envision Virgin Racing, we are never down for long at all and we always look forward to the next opportunity. Last weekend was the first round in Formula E’s five year history that our Managing Director Sylvain Filippi had missed a race. He had a pretty good excuse though, as he was back in the UK awaiting the birth of his second child. Chris [Gorne] and I have been responsible for the operational side of the team for a while now, so apart from Sylvain not being actually on site at the track it was much the same setup for us this weekend. Chris majors on the technical side and I do the operational and sporting roles, it works well. We were also in regular contact with Sylvain throughout the event. In practice Sam and Robin were reasonably happy with the cars and the run programs we did in addition to the setup work. It was generally positive and they both felt pretty happy. Qualifying in Formula E is super tough. Group 1 is a hard group to be in because the drivers are always still feeling the conditions and in some ways pioneering the session. Sam struggled for grip as he was the first out and the conditions were challenging for him and he ended up back in 16th on the grid. Robin lined up in 12th and by his own admittance didn’t quite get the maximum from his lap, so he was a bit disappointed. It is such a fine line in qualifying and Robin lost a bit of time in the last sector. Still, from the sixth row of the grid, and knowing what a great racer Robin is, we knew that a good points haul was in the offing for us. The race pace was there as Robin showed and he immediately started to cut through the pack, something which he is so good at and has shown it time and time again. He managed to muscle his way passed [Pascal] Wehrlein, then [Edoardo] Mortara and then [Jerome] d’Ambrosio in the early stages. We elected to take quite an early first Attack Zone boost for Robin and he was tucked up behind Lucas di Grassi’s Audi. He then made a very impressive move around the outside on di Grassi, probably one of the moves of the season so far in my book. This got him seventh position and he stayed there until Sims’ red flag triggering accident which elevated him to sixth. At the restart Robin had to defend from di Grassi but ultimately was unable to resist a robust move which made some contact between the cars. Despite this we were still in a good position, but going into the final laps [Sebastien] Buemi made a move going into the hairpin and we all saw what happened next. The contact Buemi made on Robin pushed him into di Grassi and it was instantly game over with a damaged car. There was little Robin could have done because when you are hit from the rear it puts the rear wheels up in the air and he had no brakes, so he was just a passenger really. It was a big shame for Robin who had driven brilliantly up until that point. Similarly, we were sure that Sam would have followed Robin through and have been able to grab a few points at least. Sadly, it was never to be as he got taken out on the first lap by [Stoffel] Vandoorne. This damaged the rear of the car and probably the driveshaft which meant he was out on the spot, so you had to feel for Sam really. Despite this frustration we were still in the lead of the championship which was at least a decent positive to take away from Sanya. It was great to welcome the Founder and CEO of Envision, Lei Zhang, to the garage on race day. His presence and support really gave us some extra impetus at Envision Group’s home event at Sanya. The Envision Virgin Racing team worked very hard again at the weekend but on this occasion it went unrewarded. Our confidence is still high though because we know we have a great team and a quick car, so we go to Rome hungry to not only defend our championship lead but also to try and extend it. 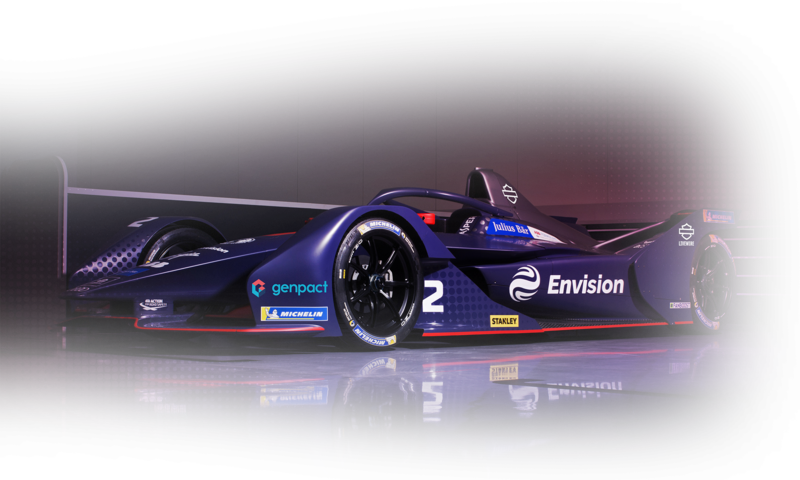 Formula E is just so competitive this season and there is no one team that is dominating, so I think we should be quite proud of where we are. At the same time this is the type of team that keeps its feet firmly on the ground, so we will keep on striving to keep improving with every lap as we head to Rome for the start of the European leg of the championship.